Your first visit to our office is a very important one. It is at this visit that you will become acquainted with our team, get the chance to ask questions about your treatment and orthodontics in general, complete your complementary exam, and more. We know your time is valuable, so if treatment is indicated Dr. Adelsperger will recommend finishing the diagnostic records following the exam, which include cephalometric x-ray and impressions. As a courtesy to our patients there is no fee for the initial examination and diagnostic records. We request that all decision makers be present for this appointment so options regarding treatment decisions can be made. Awesome professional staff! 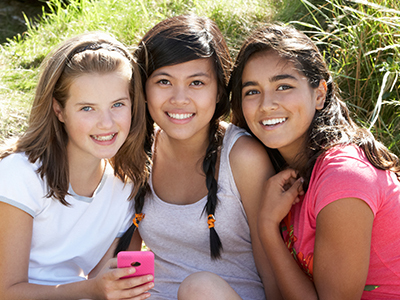 Dr. Jayme is very precise about her orthodontics and cares for her patients! These folks have the most positive attitude of any place I have ever been! They make the whole experience fun! Good news!The new techniques and appliances we use greatly reduce discomfort levels, decrease the frequency of visits, shorten treatment time, and may allow you to choose from several options. Your options may include metal braces, translucent braces, and even transparent aligners that can be worn at night to improve mild cases of misaligned teeth. Creating a beautiful smile requires both a commitment from us and the cooperation of you, our fabulous patient. With that in mind, we are excited to introduce our Patient Rewards Program! Our program was created as a way to recognize all of your hard work by awarding you with fantastic rewards as you progress along your orthodontic journey. You may redeem great prizes on our website for as low as 50 points. Look for additional contest information at our office, on Facebook, or our website to earn even more points and to see the latest updates in our Rewards Program! 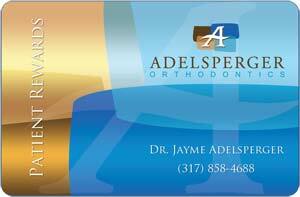 You can view your points any time at www.AdelspergerOrtho.com. Click on the Patient Rewards card icon and enter your 16-digit rewards number and 4-digit password to check your current points. View the on-line Reward Guide and check for special contests and gifts. If you have any questions, talk with any of our team members! Earn Points On Your Patient Rewards Card During each appointment, points will be awarded for outstanding cooperation in each of the following areas. To redeem your points, visit us online or speak with any of our team members!